Making your own nut butters is much easier than you think. Having a good blender though will be key. Mine is by KitchenAid with a pretty powerful motor, but blenders like Vitamix would definitely do even better. Starting the blender on the lowest speed helps keep it from clumping together and creating air bubbles that stop it from mixing. When you start, you will have to stop the blender and scrape the sides a few time, and add more oil as you go (not too much! Just a couple of tablespoons at a time) to increase the smoothness. 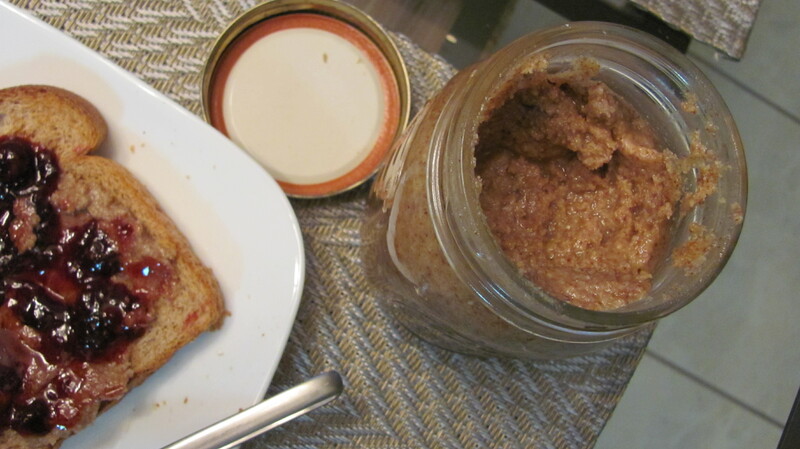 In this particular batch of almond butter, I added a little honey and cinnamon for sweetness. You can add brown sugar or maple syrup too if you like it sweet. I also toasted my almonds before blending, but you could also leave that part out and have raw almond butter. Any kind of nut could be used – macadamias, peanuts, hazelnuts, walnuts, maybe even sunflower seeds would probably work too! Start by chopping all the almonds dry. Make sure the lid is on tight! This will only take a few seconds because they’ll now be sticking to the sides of the blender. Add about 3/4 cup of oil and start on the lowest speed. If they are stirring well, increase the speed. If an air bubble is created, stop the blender, scrape the sides and start on the lowest setting. Once I was able to get a somewhat creamy consistency, which was achieved after adding the honey and cinnamon, I could increase the speed up to “chop” mode and it was spinning around and around well. Blend until desired consistency is achieved. Save in an airtight jar and eat within about 1 week of making. Sometimes foods with oils can go bad quickly.